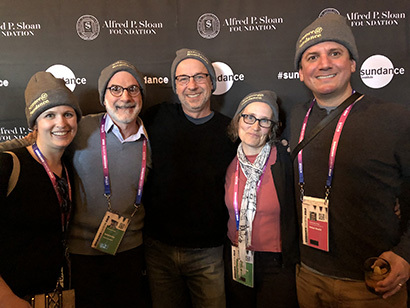 Scientists at the 2019 Sundance Film Festival (left to right): Valerie Thompson, Science magazine; Robert Strauss, Icahn School of Medicine at Mount Sinai; Paul Koch, UC Santa Cruz; Gabrielle Kardon, University of Utah; Michael Shapiro, University of Utah. When Paul Koch, dean of physical and biological sciences at UC Santa Cruz, attended the 2019 Sundance Film Festival, it was not his first time at the renowned independent film festival. This was different, however, because he had an assignment from a magazine editor to write movie reviews. Koch and four friends and fellow scientists reviewed 10 movies with science or technology themes for Science magazine, published by the American Association for the Advancement of Science. Their reviews will be published in the March 22 issue of the magazine and are now available online. Gabrielle Kardon, a geneticist at the University of Utah (and Koch's former graduate school housemate), had pitched the idea to Valerie Thompson, Science's editor of book and media reviews. In 2018, Kardon had reviewed the documentary Three Identical Strangers for Science, but she thought that Sundance merited more attention from scientists. "I was in Salt Lake City on sabbatical, and Gabrielle and I started talking about it after the 2018 festival, because there were some really good movies that dealt with science or issues related to science, and we thought it would be good to let people know about them. Gabrielle had the idea of sending a team of scientists to the festival and invited me along for the ride," Koch said. One of the movies he reviewed was Sea of Shadows, a documentary about efforts to save the vaquita, "a tiny porpoise of Disneyesque cuteness" that is "hurtling toward extinction." Koch also reviewed Bedlam, a disturbing film about mental illness, mass incarceration, and homelessness in the United States. Other films included The Boy Who Harnessed the Wind, reviewed by Kardon, which won the Alfred P. Sloan Foundation Feature Film Prize. The Sloan Foundation's Science-in-Film initiative supports emerging filmmakers whose work explores scientific themes and characters and their place in our culture.